Pista Marillin is an Imperial commoner who waits tables at The King and Queen Tavern in the Imperial City Elven Gardens District. She is often found betting at the Arena; her attitude to the Arena is ambivalent—on the one hand, she is disgusted by the bloodshed but, on the other, she says she cannot bring herself to leave due to her gambling problem. She wears a set of middle class clothing: a burgundy linen shirt, burgundy linens and a pair of russet felt shoes. She also has a small amount of gold. She can also be found walking along the Green Road to Leyawiin where she will occasionally be killed by bandits. If you first meet her in The King and Queen Tavern she will say, "Welcome to The King and Queen Tavern. We treat all our patrons like royalty! I'm Pista Marillin, your faithful lady-in-waiting." If you meet her in the Arena she will say, "This is all so grisly and horrible, isn't it? The blood and bodies... But I've won so much money! I can't stop betting! 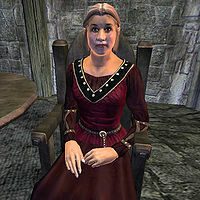 I think I need help..." If you ask her about the Imperial City she will say, "Where can you find a bed in the City? I hear the Tiber Septim Hotel in Talos Plaza is very nice. In the Elven Gardens, Luther Broad's Boarding House may suit less discriminating customers. Fighters Guild has no accommodations in town. Mages Guild members have their own quarters at the Arcane University. I can't recommend the Bloated Float on the Waterfront. The Waterfront is not a very desirable location." Pista was supposed to sleep from midnight until 6am, but there are no beds in the taproom, so she just wanders around all night.